Obituary for James J. Yuhas, Sr | Fleming & Billman Funeral Directors, Inc.
James Yuhas, Sr. 90 of Austinburg, Ohio died Saturday (Sept. 1st) in the Hospice Unit at Ashtabula County Medical Center. He was born September 19, 1927 to John and Theresa (Bartok) Yuhas in West Virginia. James was one of seven children. He was a graduate of Austinburg High School and married Waneta Burlingame on November 27, 1948 and together they had four children. He was a veteran of the US Army serving during the Korean Conflict. He was a member of the VFW, Moose and the Farm Bureau. James was employed with Reliance Electric for 30+ years until his retirement. He enjoyed camping; Pymatuning and Chapman Dam were to of his favorite places. He also was an avid fisherman. 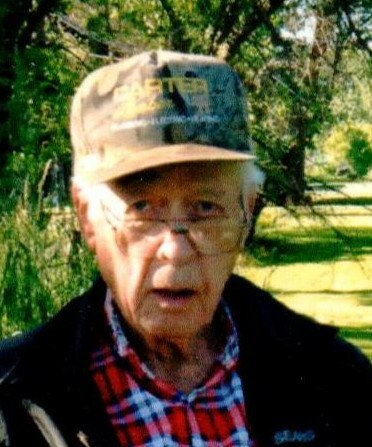 He enjoyed working on things such as building a home, cabinets, working on a tractor, or working on a bulldozer and he was good at all these items. James is survived by his sister, Mary; a son, Patrick (Patricia) Yuhas, Daughter-in-law, Cherie Yuhas and nephews, Mike and Rick; his grandchildren, James Yuhas III, SSG Lindsay (Adam) Humble, Lauren Carey, Jamie (Jeremiah) Hines; several great grandchildren and dear friend, Barb Wittenmyer. He was preceded in death by his parents, his wife, Waneta; sons, David and James, Jr.; daughter, Christy Lou; sisters, Theresa, Janette, Margaret and Helen; a brother, Steve and Nephew, Tim. The family would like to thank all the caregivers who helped keep James at home as long as possible. Also would like to thank Austinburg Nursing – Nursing Staff, ACMC nursing staff and Hospice of the Western Reserve. Funeral service will be Wednesday (Sept. 5th) at 1:00 PM at the Jefferson Home of Fleming & Billman Funeral Directors and Crematory, 49 West Jefferson St. Jefferson with Pastor David Bailey officiating. Burial will be in Oakdale Cemetery with Military rites. Visitation will be Wednesday from 11:00 AM until the time of service at the funeral home. Memorial contributions can be made to Hospice of the Western Reserve, 1166 Lake Ave. Ashtabula, Ohio 44004. The Fleming & Billman Funeral Homes, Ashtabula, Geneva and Jefferson are honored to serve the James Yuhas family. Condolences, light a candle and obituary at fleming-billman.com.